Project on hold until further notice, contact us for more info. White Peak Lodge in Alpe d’Huez is a new development of luxury ski-in ski-out apartments by the pistes (along a beginner’s green slope you ski back straight to your apartment and it is in front of the new gondola lifts) with exclusive facilities like an indoor and outdoor swimming pools, sauna, Spa, a kid’s club and more. These spacious new apartments (69 units ranging from 2-5 bedrooms sold fully-equipped, furnished and decorated) located over three traditional chalets (excellent value per sqm around 7,500 euros including furniture pack, kitchen, cave for storage and private parking) are sold fully-equipped and furnished | with flexible rental management in place and with full 20% VAT refund on price. For more convenience, the residence offers a sofa bed for extra sleeping in the living room, underground parking (some of the bigger apartments come with 2 units), luggage storage, laundry, and heated ski storage. A concierge service is proposed for owners. 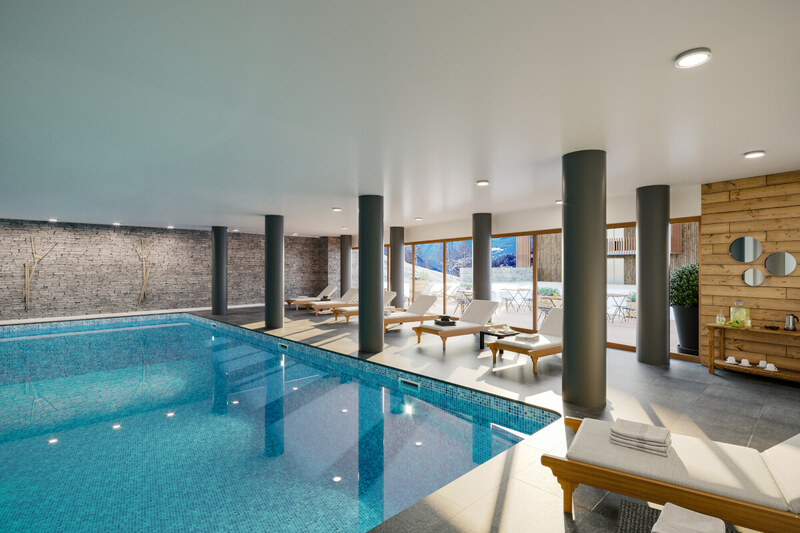 White Peak Lodge is a new development of luxury ski-in ski-out apartments (2-5 bedrooms) by the pistes (along a beginner’s green slope so it is very easy and it is only 50m from the new cable car) with exclusive facilities like an indoor and outdoor swimming pools, sauna, Spa, a kid’s club and more. 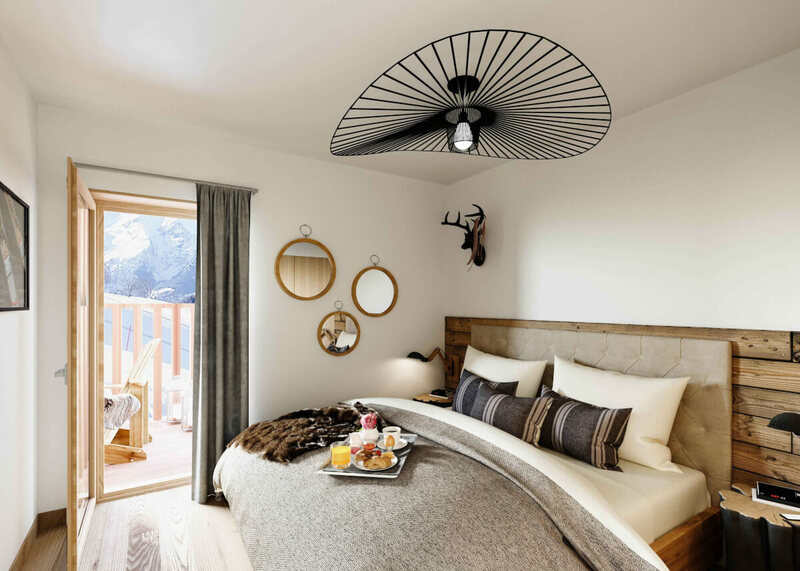 For the shops, bars and restaurants, nothing more simple, White Peak Lodge apartments for sale are only 5 minutes walk from all Alpe d’Huez amenities. These spacious new apartments (69 units ranging 2-5 bedrooms, sold fully-equipped, furnished and decorated) located over three traditional chalets (excellent value per sqm around 7,500 euros including furniture pack, kitchen and private parking) are sold fully-equipped and furnished | with flexible rental management and with full 20% VAT refund on price. What does the price include for an apartment for sale at the White Peak Lodge? With 69 apartments ranging from 2-4 bedroomed units (extensive private terraces for all), the White Peak Lodge welcomes you with its relaxed atmosphere. Materials such as wood and local stone offer a warm atmosphere. Its modern furniture and design bring a touch of modernity combined with a traditional Alpine identity as we like it. Furnished and equipped, the apartments open onto terraces or balconies with stunning views of the mountains. Authenticity and modernity will combine to guarantee premium services. Each apartment has a ski locker and a parking unit. There is also plenty of space with the lounge/reception areas where you can meet your friends or family. What are the kitchen fixtures at White Peak Lodge? Apartment fixtures: Gas general heating with individual counters (communal boiler), entry code, fireplace in main lounge, lift to all floors, parquet floor in all rooms except wet rooms (40 x 40 tiled floors), wood-cladded terrace floors, white paint satin finish in all rooms with one wood-cladded wall living room and wood cladded area headboard in bedrooms and tiled walls in wet rooms. Hardwood doors between rooms. Indoor heated swimming pool, a hammam, a sauna, wellness showers, a jacuzzi, and a wellness area. Cave for storage: Fully-locked cave for storage. These apartments will offer flexible rental management (you stay in your apartment as you wish) to combine good rental income potential (Alpe d’Huez offers one of the best rental potentials in the Alps as the winter is super long and the summer is very popular thanks to Tour de France) with personal use. When you purchase an apartment at the White Peak Lodge you benefit from a fully-managed rental in place to generate tax-free rental income (contact for more details). You can also manage the rental of your apartment with a local agent or directly but there is no VAT reclaim. You pay purchase price adding the 20% VAT. 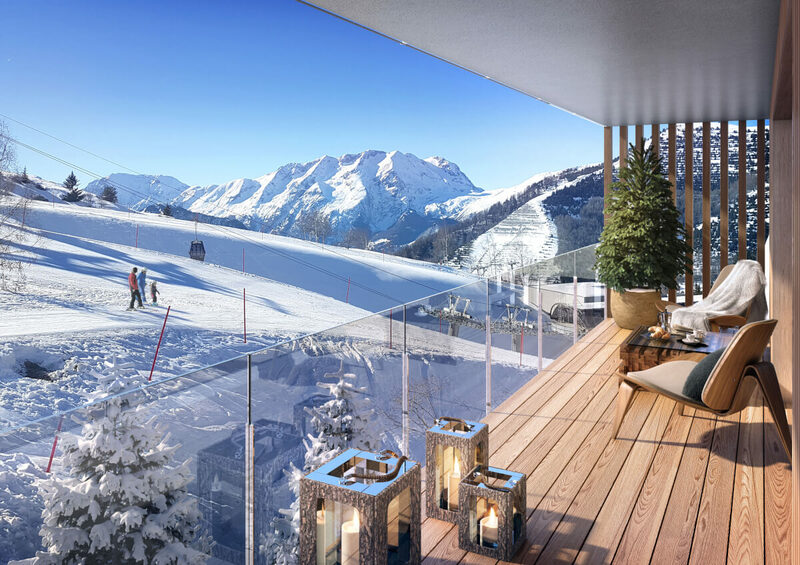 “With new link with Les Deux Alpes ski area, Alpe d’Huez is the place to invest in a ski property at the moment, and at average 7,500€/sqm including parking and furniture (excluding VAT), the White Peak Lodge is at a very competitive price for Alpe d’Huez. 2-5 bedroom apartments sold fully-equipped & furnished with ski locker, a private storage room (cave) and private parking (1 or 2 units depending on the property). There is no obligation to purchase a furniture pack. 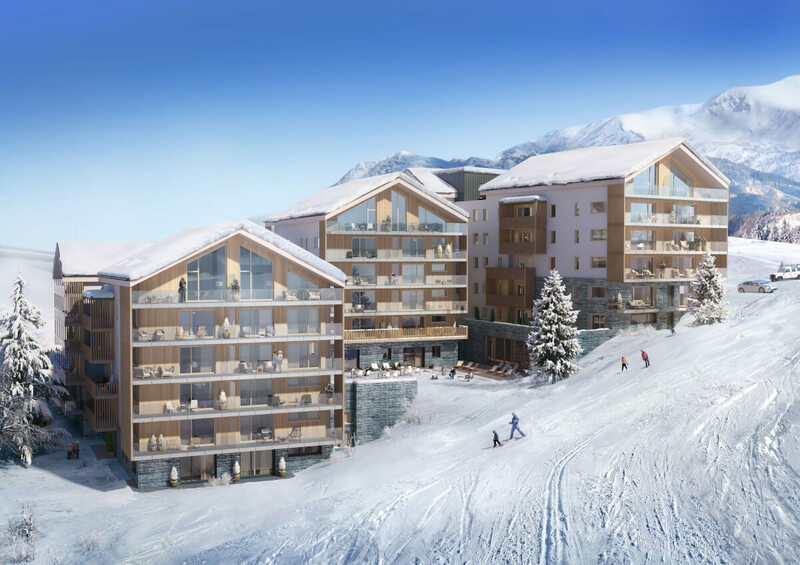 Just ski back straight to your apartment, in a fantastic ski in ski out location on easy beginner’s slope ideal for families and in front of the brand new gondola lifts opened in 2018. The best ski location! This brand new development (69 apartments), is only 100 meters from a selection of shops, bakery, restaurants and bars, ideal location! -Nicknamed “The Sunny Island” the Alpe d’huez weather is renowned because of its exceptional sunshine (about 300 days a year according to French weather forecast), the Alpe d’Huez is a ski destination of international reputation. 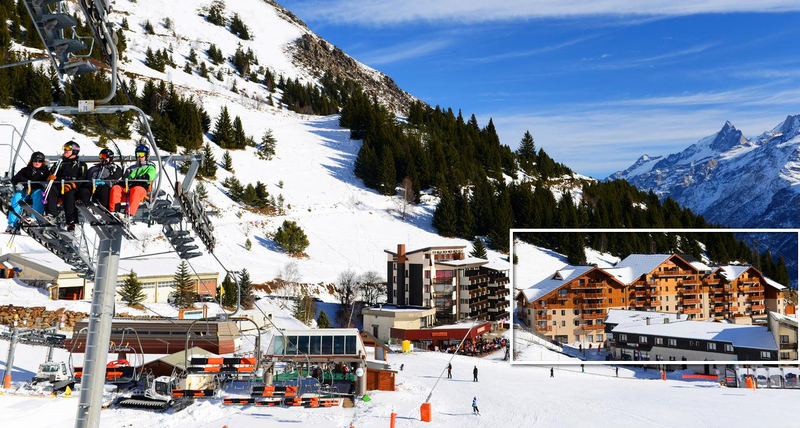 Located on a south-facing plateau at an altitude of 1860 meters overlooking the Oisans valley, the ski resort of Alpe d’Huez benefits from many assets, like its high altitude up to 3,300m, 252 km of pistes, 2 snow-parks and 111 pistes. It is also why buying a ski property for sale in Alpe d’Huez is becoming so popular.